What are realistic expectations for Ilya Kovalchuk? Ilya Kovalchuk danced from coast to coast, splitting the Vegas Golden Knights’ defence on Thursday night and the proclamations started pouring in. He’s back! Look at those wheels! He’s still got it! All of which raises the question: What can we realistically expect from Kovalchuk this season? Kovalchuk, now 35, is one of the most interesting storylines of the season as he returns to the NHL after a five-year hiatus in Russia. He signed a three-year, $18.75 million deal with the Los Angeles Kings to take a run at becoming the 29th member of the Triple Gold Club. All that’s missing is a Stanley Cup to go along with Kovalchuk’s Olympic gold medal from PyeongChang and two IIHF World Championship golds. It’s clear the Kings are expecting big things - both based on salary commitment and early lineup placement. 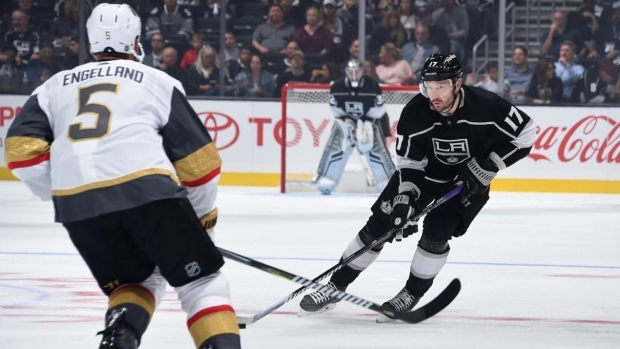 Kovalchuk started the preseason on a line with Hart Trophy finalist Anze Kopitar and Dustin Brown, who is coming off a career-best 61-point campaign. Clearly, the Kings – and his other suitors – had eyes on Kovalchuk for a while. They watched him win Most Outstanding Player for the Olympic Athletes of Russia. They followed as he led the KHL scoring in 2017-18 with 63 points in 53 games and helped SKA St. Petersburg to two Gagarin Cups in five years. There is also no question they did the math. He has 417 goals and 399 assists in 816 career NHL games, exactly a point-per-game player. But how will Kovalchuk’s KHL numbers translate to the NHL? NHL equivalency metrics, as they are known in the analytics world, have been tested and tried for nearly a decade, but remain an imperfect and much-debated science. Particularly when it comes to the KHL - the so-called second-best hockey league in the world - it is difficult to account for nuances like the fact it is a poorly balanced league with the haves routinely feasting on the have-nots. Nonetheless, many have tried. To help set expectations, we averaged the formula of three prominent point translators in the field, Rob Vollman, Kent Wilson and Manny Perry, to try and developed a well-rounded answer. The average of their three formulas estimates that one point in the KHL is worth roughly 0.763 points in the NHL. It is overly simplistic, based on historical production. Some players have significantly exceeded that translation (Artemi Panarin), while many others have fallen short. At first glance, the average seems to translate well for Kovalchuk. During the 2012-13 lockout-shortened NHL season, he started the year with 42 points in 36 games for SKA St. Petersburg. That would translate to 32 points in the same number of games in the NHL. Kovalchuk came back to the Devils that season, his last in the NHL, and netted 31. Close enough. Last season, Kovalchuk led the KHL with 63 points (31 goals and 32 assists). The NHL equivalent of that for Kovalchuk this season with the Kings would be 35 goals and 37 assists for 72 points. He has averaged 79 games played per season in his NHL career. Does that sound high? It would be 11 points below Kovalchuk’s last full season NHL output, in 2011-12, when he collected 83 points with the Devils as a 28-year-old. Last season, those expected numbers would have tied Kovalchuk for 15th in the NHL in goals (35) and 31st in points (72) – a tie with fellow KHL convert Alexander Radulov. Radulov, now 32, did not hit his translation equivalent when he returned to the NHL two seasons ago with the Montréal Canadiens, but still put up a respectable 54 points in 76 games. Radulov then exploded for 27 goals and 72 points last season with the Dallas Stars, much closer to the expected number. There are many factors in play with Kovalchuk that no equivalency formula can compensate for, including the style of the team he’s going to play for, his deployment and linemates, his age curve and the fact that he already has significant NHL data on his resume. Almost no one has done what Kovalchuk is attempting to do – certainly not on a contract that will take him to his 39th birthday. It won’t be as easy as it was for Kovalchuk on Thursday night against the Golden Knights, not in the third period of a preseason blowout with so much room thanks to an ECHL-level gap from defenceman Nicolas Hague. But if Kovalchuk can burst back on to the scene with 35 goals and 72 points in his first NHL action since 2013, the Kings will surely be getting their money’s worth.